Tony and I had a very festive weekend. Sunday we had Christmas brunch with Mike, Jen and Jamie -- and Saturday we celebrated with Camille and Matt. Even Victor got in on the gifts. 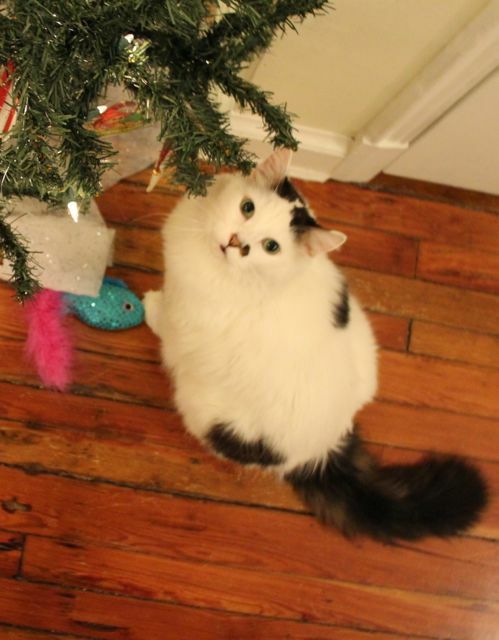 And as you can see, he has been a very good kitty this year. Camille and Matt brought him a fish made of sparkles and feathers that he's been carrying around the house ever since. 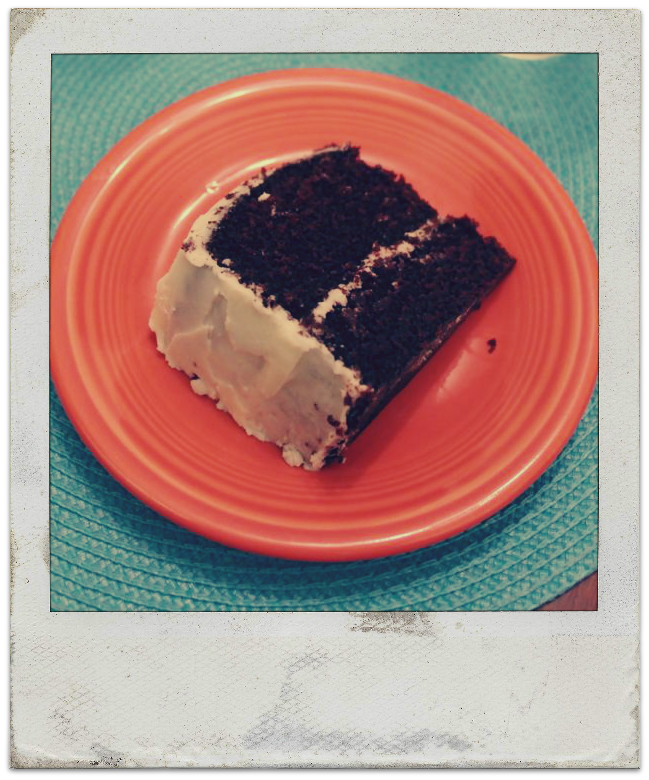 For dessert on Saturday night, I made a chocolate olive oil cake with vanilla frosting. This is my go-to chocolate cake. Also, I think some kind of magic happens in this recipe with baking soda and vinegar to make the cake rise. You don't need eggs or dairy for this cake, so you can make it completely with ingredients in your pantry. Mix dry ingredients in a stand mixer bowl. In a separate bowl, combine the wet ingredients. Add wet ingredients to dry ingredients, and mix until no lumps remain. Grease and flour two 8-inch round pans or a 9-by-13-inch pan. Bake at 350 degrees for 40-43 minutes in the round pans for 40 minutes in the large pan. Cake is done when a toothpick comes out clean. Once cake pans are cool to the touch, turn out the cakes and let cool completely on a wire rack. 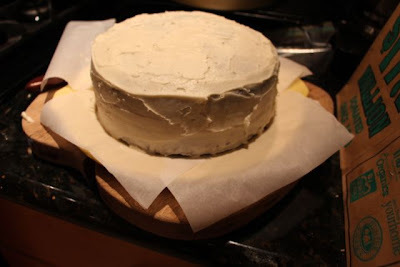 If making a two-layer cake, use a bread knife to cut the top of off one of the layers. Frost with the vanilla frosting recipe below. 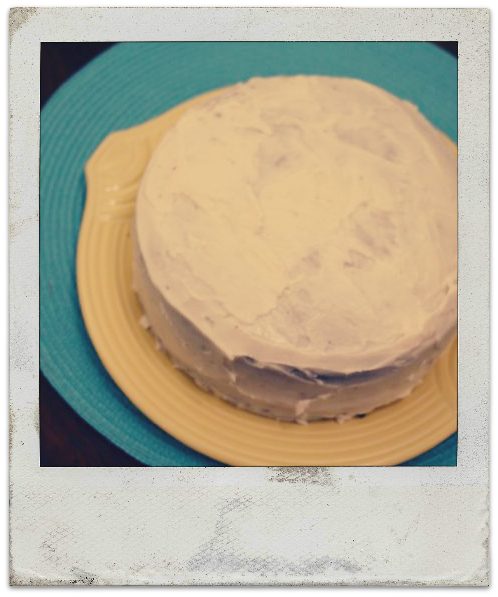 Stick sheets of parchment paper under the cake while you're frosting it, so the plate is tidy after you remove your parchment paper. Combine powdered sugar, butter and vanilla in a stand mixer bowl. Add milk, 1/2 tablespoon at a time, until frosting is a spreadable consistency.